Bergen in Norway is more usually associated with Black Metal than Psychedelic rock, but Electric Eye's latest release shows the Norwegians can produce some excellent psychedlic music. The album includes plenty of elements guaranteed to give that pschedelic sound - the use of the Sitar, tape echo, bongos and backwards guitar solos for a start. 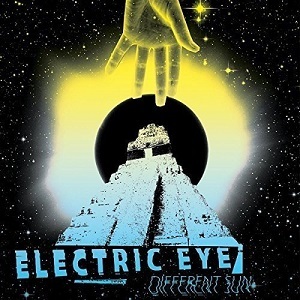 Of course having those elements doesnt guarantee a good finished product, but Electric Eye have crafted seven songs that are really impressive. Some psychedelic rock can be so bizarre it is hard to listen to but the songs here are very listenable - I've been listening to the album most of the day, and I'd say that this is some of the best psychedlic rock I've heard in a long time. At times (particularly in the final song ("Part one") it reminds me of Pink Floyd. It's an excellent album - definitely recommended both for fans of psychedelic rock, and also for those music lovers who wouldn't describe themselves as fans of psychedelic rock but do like Pink Floyd. "Different sun" is out now.